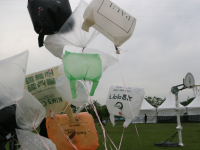 When I was young, I saw my grandmother collect plastic bags and pile them up neatly in the corner of the kitchen. One day I found myself doing the same as my grandmother. In my kitchen, plastic bags continued to pile up. 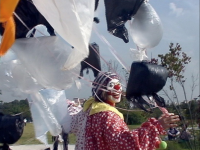 I decided to put helium gas in the plastic bags to make balloons. 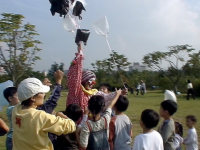 And then, hoping that it could give unexpected pleasure to children, I asked a clown to present those plastic bag balloons to them at the park.